Cheltenham Town moved seven points clear at the top of the National League table thanks to a hard-fought win over bottom-of-the-table Kidderminster. Danny Wright's strike, his 10th goal of the season, put the Robins ahead. Kyle Howkins levelled the scores before half-time, scrambling the ball home after a corner. But Cheltenham ensured a fifth consecutive win in all competitions in the second period when captain Aaron Downes headed in a Jack Munns corner. "To be fair to Kidderminster they didn't play like a bottom of the league team, they made it a proper derby and we had to fight for everything we got. "We had to be sure that we were going to win the game and the only way we could do it, was the way we played in the second half. "We needed a lot more energy, a lot more thought, a lot more blocking things, a lot more winning headers and once we did that and kept it up front a little bit more then they couldn't get in." Match ends, Kidderminster Harriers 1, Cheltenham Town 2. Second Half ends, Kidderminster Harriers 1, Cheltenham Town 2. Offside, Cheltenham Town. Billy Waters tries a through ball, but Billy Waters is caught offside. Substitution, Cheltenham Town. Asa Hall replaces Jack Munns. Attempt missed. Gurjit Singh (Kidderminster Harriers) left footed shot from the right side of the box misses to the left. Substitution, Cheltenham Town. James Dayton replaces Ryan Jennings. Attempt blocked. Jack Munns (Cheltenham Town) right footed shot from the left side of the box is blocked. Substitution, Kidderminster Harriers. Elton Ngwatala replaces Lathanial Rowe-Turner. Danny Parslow (Cheltenham Town) wins a free kick. Substitution, Kidderminster Harriers. Gurjit Singh replaces Matthew Barnes-Homer. Goal! 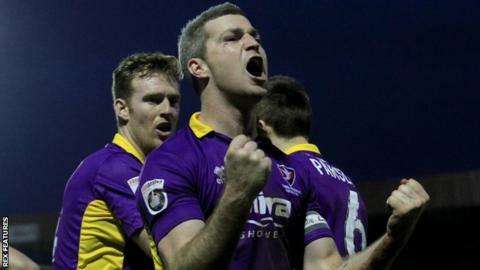 Kidderminster Harriers 1, Cheltenham Town 2. Aaron Downes (Cheltenham Town) header from the centre of the box to the bottom right corner. Attempt saved. Billy Waters (Cheltenham Town) right footed shot from the centre of the box is saved. Foul by Zaine Francis-Angol (Kidderminster Harriers). Ryan Jennings (Cheltenham Town) wins a free kick. Attempt saved. Kyle Storer (Cheltenham Town) header from the centre of the box is saved. Assisted by Jack Munns. Attempt saved. Ryan Jennings (Cheltenham Town) left footed shot from outside the box is saved. Attempt saved. Harry Pell (Cheltenham Town) header from the right side of the six yard box is saved. Attempt saved. Daniel Wright (Cheltenham Town) header from the left side of the six yard box is saved. Foul by Matt Young (Kidderminster Harriers). Attempt saved. Ben Whitfield (Kidderminster Harriers) right footed shot from outside the box is saved. Assisted by Jared Hodgkiss. Hand ball by Daniel Wright (Cheltenham Town). Foul by Kelvin Langmead (Kidderminster Harriers). Omari Patrick (Kidderminster Harriers) wins a free kick.